This is me in the garage solder mitrek head plugs that connect the Motorola radios to the control system. Each radio uses a head plug that carries power, PTT, discriminator audio and transmit audio to the Mitrek radios to and from the control system. 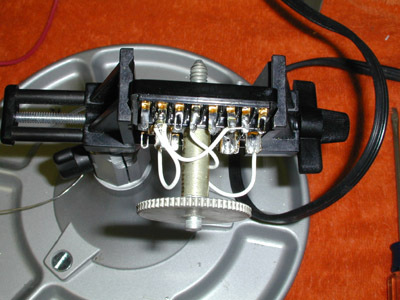 This is a close up of the inside of a Mitrek head plug. We use special Calnet standard wiring inside these plugs so that all Calnet repeaters sites are wired the same. 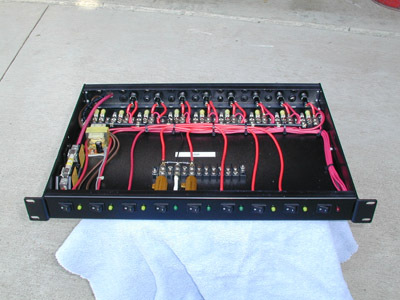 Cliff (KA6JRG), designed and wired the inside of the DC power distribution and switch box for the rack. This is a new low profile design for Calnet. This switch box will be used to turn DC power on and off to various items in the rack. Top view of the DC power switch box. Cliff did a wonderful job on this box! It has many neat features and built-in protection. Should we have a power spike in the rack this switch box will protect the various items in the rack. Cliff spent about 15 hours of labor building this box. Thanks Cliff! This is a back view of the DC power switch box. 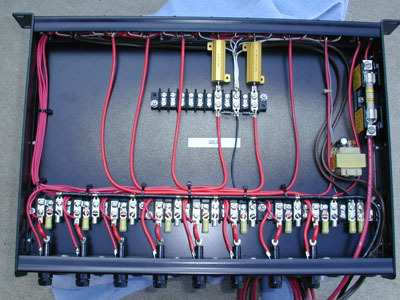 Notice the fuses for each item that will be connected to this box. 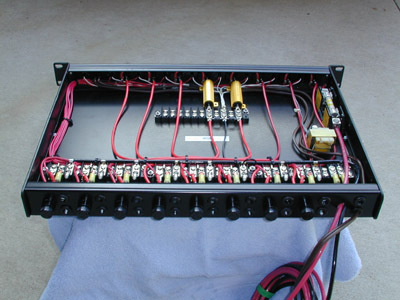 The black and red wire will be connected to the DC power supply in the rack and power all items in the rack. Its just great to finally start having all the needed Otay parts arriving in the mail. Everyday something new show up in the mail. Its like putting a big puzzle together with all the pieces arriving at different times. 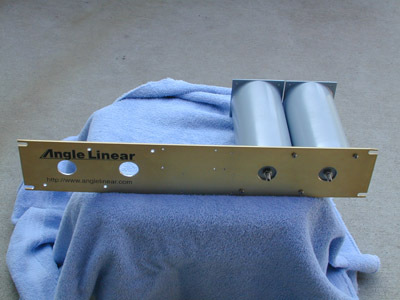 This is the front view of a Angle Linear pre-amp for the repeater receiver. 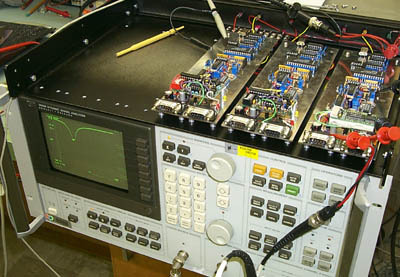 This is the back view of the Angle Linear pre-amp and band pass filters. 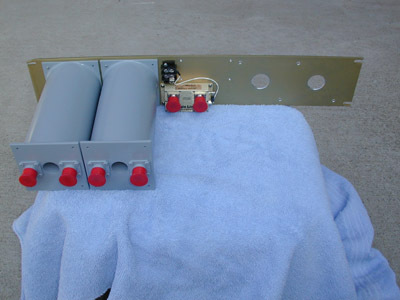 The gray looking cans are band pass filters that protect the pre-amp and repeater receiver from being overloaded by strong adjacent signals near the receive input of the repeater. 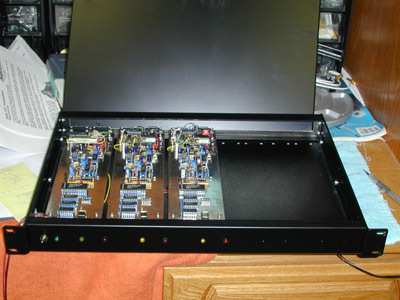 Front view of the UAB box with 3 UAB's inside. 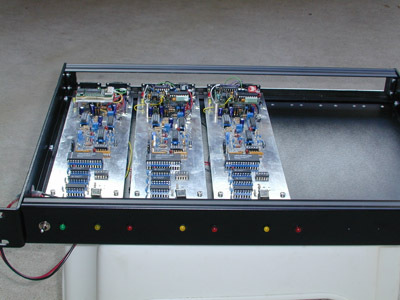 These boards are what makes Calnet's audio sound so good. You will often hear us talk about UAB's on the system. UAB stands for "Universal Audio Board"
Top view of the UAB's. Gerry (KB6OOC) and Cliff (KA6JRG)developed and designed these boards for Calnet. 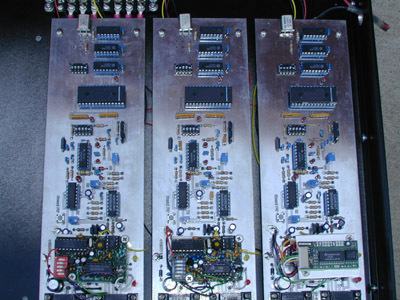 Gerry soldered all the parts to these 3 boards. Each one of these boards takes about 6 hours to build. Front view of the UAB box. When we install this box into the rack there is a lid that is placed on top of this box to protect the equipment. Gerry did a great job of building this unit. Probably about 20 hours of labor to build this entire unit. Thanks Gerry! 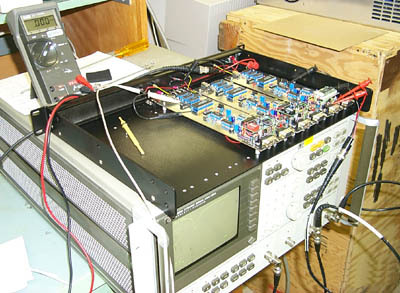 This is a view of the the test setup in the lab. After each UAB is built it goes through extensive testing in the laboratory to make sure that each UAB is working properly. This is yet another view of the testing process to make sure that each UAB is working. Notice all the the test points on the UAB that are hooked up for the test setup. 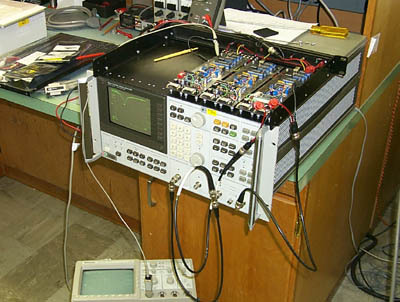 This is the network analyzer showing the UAB notching the receive PL by 35 dB. Calnet uses the UAB to notch out all received PL out of the audio before it is passed to the other appropriate transmitters. Note: The very narrow notch which only removes audio in the frequency spectrum of the desired PL. All other audio is left untouched. Well that about does for this web page segment. 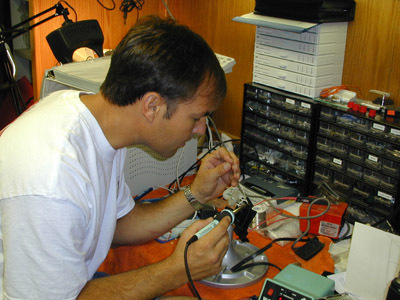 We have been really busy soldering, testing and installing all the various components of repeater. We have really had a fun time putting all these parts together. Until the next page is updated with new information!